The world’s largest democracy, India is in the midst of a massive electoral exercise. While the media is understandably focused on the polls, a debate is gathering momentum in the country’s frontier province of Assam. Once known for its relentless insurgency, the northeast Indian province is making its presence felt in the realm of wildlife conservation. Assam is home to more than two-thirds of the surviving population of the Indian rhinoceros, also known as the greater one-horned rhinoceros (Rhinoceros unicornis). These animals—presently listed as vulnerable—roam protected forest reserves, including Kaziranga National Park (where there are 2329), Pobitora Wildlife Sanctuary (100), Orang National Park (95) and Manas National Park (22). 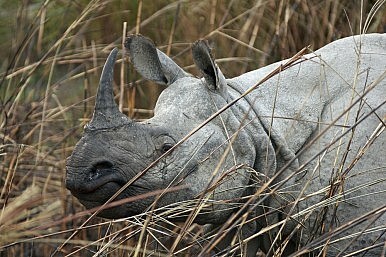 The rhino is protected under India’s powerful wildlife act, which has been in effect since 1972. Despite that, because of rampant poaching, Assam is losing these prized animals. Assam lost at least 10 rhinos to poachers in the first three months of 2014. A total of 41 rhinos were killed in Assam forest reserves in 2013, up from 22 in 2012. In each case, the killers were after the prized horns, which they can sell in illegal markets in China, Vietnam, and now also in Australia. Even today, rhino horns—formed by the hairs on the nose of the animal—are widely believed in Asia to be an aphrodisiac. Often called “black ivory,” they are also used as a cure for many ills in traditional oriental medicine practiced in China and Vietnam. Scientific evidence for any of these applications is decidedly lacking. Given the difficulties the Assam forest department has had in combating the poaching of rhinos, it has recently come up with a new idea: trimming the horns of the animals, making them unattractive to poachers. The government has called for public comment on an initiative that would trim the horns of translocated and stray rhinos. In fact, the initiative has already attracted opposition, with Assam conservation groups coming out with strong statements against the initiative. Nature’s Beckon has denounced it as “conservation tactic without proper research” and warned that the practice of dehorning of rhinos may have “negative implications for the breeding of the animals. “As per the available research findings, we can argue that the horn of the rhino has its specific role in the ecology and behavior of the species. It cannot be distinguished as a vestigial part of the body. Though the evolutionary significance of horns in rhinos is not entirely clear, it may include mate choice as well as anti-predator defence. It is known that rhinos use their horns for several behavioral functions, including defending territories, defending calves from other rhinos and predators, maternal care and foraging behavior,” said Soumyadeep Datta, director of Nature’s Beckon. The act of dehorning has been debated for more than a decade, yet the efficacy of the process remains unknown. However, the dehorning of rhinos in Africa appears to have had negative repercussions for the biological growth of the animal. Also expressing opposition was Aaranyak, a leading biodiversity conservation group. It’s secretary general Bibhab Talukdar argues that dehorning rhinos should be the last option to protect the animals from poachers. “We feel that protection measures must be strengthened on a priority basis to protect the rhinos and other wildlife. Dehorning is not the ultimate solution to check poaching, but it may be a strategy to buy time like the African nations,” said Talukdar. A number of student and civil society groups have condemned the government for its failure to protect the animals in forest reserves. They were joined by political parties and other groups in staging street demonstrations and burning effigies of Assam forest minister Rockybul Hussain and State chief minister Tarun Gogoi while demanding a high level-probe into local poaching. Opponents of dehorning are unanimous in demanding that rhinos and other wildlife be protected, irrespective of which party takes power in New Delhi after the month-long general election currently underway. The ruling Congress alliance—which looks likely to be ousted—has assured wildlife lovers across India that it will step up its efforts. Conservationists will have to wait and see whether a new government will make the same commitment. Nava Thakuria is an Assam, India-based environmental journalist.